The hydraulic pot tappet is a part of the timing mechanism. 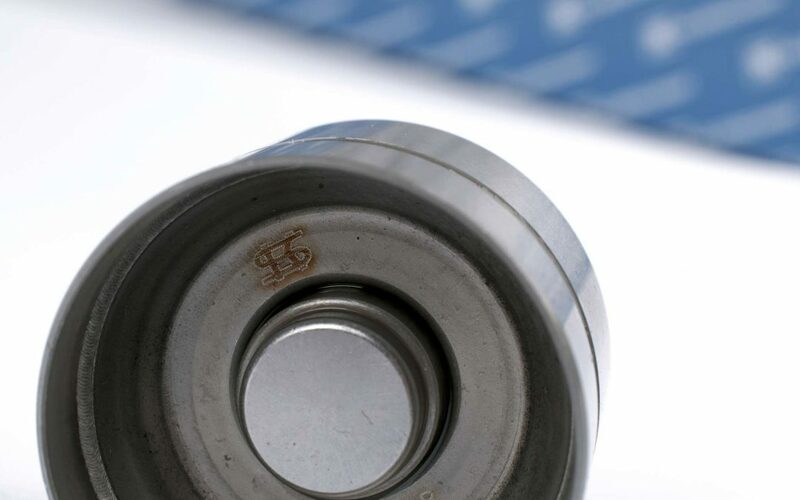 The tappet working surface is ground and hardened, in some cases the tappet walls are equipped with a black protective lacquer (similar to the pistons). The transfer of the stroke of the cam to the valve is done by rocker arm, using a pulley or directly on the stem. This solution is also suitable for high-speed motors. Unit Injector System (UIS) engines are equipped with a pot lifting device in combination with a hydraulic element defining the valve clearance. This design is called the hydraulic tappet. The hydraulic tappet automatically delimits the valve clearance under all operating modes and greatly reduces the noise of the timing mechanism. Everything is assured by the hydraulically operated telescopic elements that are supplied as part of the pots tappets or separately. Components defining the valve clearances are connected to the engine lubrication circuit. The engine oil lubrication system is filled with a telescopic roller cavity via the spherical ball valve. When moving the tappet and the roller upwards, the valve is pressurized with lubricating oil and then directly controlled. In the reverse motion, the valve closes and the spring pressure returns to the piston roller. The reservoir is again filled through the ball valve with the pressurised oil. There is a labyrinth in the storage compartment of the hydraulic tappet that obstructs the oil from draining when the engine is switched off. For engine start-up mode (under inadequate lubricating oil pressure), the piston is pressed by a weak spring onto the stem of the valve, thus defining a clearance which is then zero. This valve clearance system is commonly referred to as the “hydrostatic”. To reduce wear on the work surface, the centre of the tappet and the cam are off the axis, and make the tappet to rotate. It is necessary to pay close attention to the wear of the tappets when repairs are done to the engine timing mechanisms. The optimum condition is when the tappet freely slides downwards by its own weight.